Raumfahrt+Astronomie-Blog von CENAP - Blog: Mars-Chroniken - Reality TV vom Mars? PARIS — As Wernher von Braun, the rocket scientist, used to say, the most overwhelming obstacle to exploring the cosmos isn’t gravity. It’s the paperwork. Not to mention the money. So when Bas Lansdorp began dreaming more than a decade ago about establishing the first permanent human colony on Mars, his primary focus was not on overcoming the technological challenges. It was the business model. 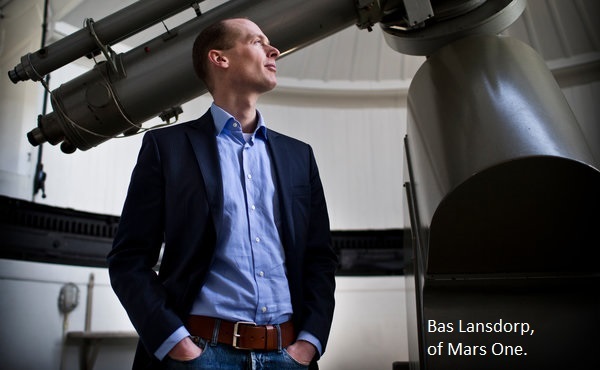 Mr. Lansdorp, a 36-year-old Dutch engineer and entrepreneur, does not have the name recognition of Dennis Tito, the American financier and space tourist, who announced a plan last month to send two people on a round-trip Mars flyby in 2018. Nor can Mr. Lansdorp hope to match the deep pockets of Elon Musk, the billionaire founder of SpaceX and Tesla Motors, who has proposed sending as many as 80,000 people to the Red Planet and charging them $500,000 each. Richard Branson, the Virgin entrepreneur, has space aspirations, too. But Mr. Lansorp is convinced that he has found the perfect plan to raise the $6 billion he says he needs to land an initial crew of four people on the Martian surface by 2023. The entire mission — from the astronauts’ selection and training to their arrival and construction of a permanent settlement — would be broadcast as a worldwide, multiyear reality television show. “How many people do you think would want to watch the first humans arrive on Mars?” Mr. Lansdorp asked in a recent interview, recalling the more than 600 million viewers who were said to have tuned in to the grainy, black-and-white images of Neil Armstrong’s first steps on the moon in 1969. For the record, Mr. Lansdorp will be executive producer, not an actor, in this extravaganza: He does not plan to make the trip himself. And despite the significant skepticism his plan has raised in some quarters, he cites his success in starting and cashing out of the wind-energy company Ampyx Power — a company trying to use pilotless, tethered aircraft to generate electricity — as evidence that he can turn lofty ideas into financially viable realities. Mr. Lansdorp declined to say how much he had made selling his stake in Ampyx, a privately held company, other than indicating it had been enough that he would not have to work for at least several years. With just 10 years to select and prepare its first crew, the project, called Mars One, expects to begin recruiting prospective astronauts online this spring. Applicants must be at least 18 years old, be physically fit and speak English, and they must be willing to live out the final selection process and an eight-year training program — not to mention the Mars mission itself — under the constant stare of a television camera. No specific technical skills or experience are required, but be sure to read the fine print: For reasons of cost and logistics, this is a one-way trip. “Reality meets talent show, with no ending and the whole world watching,” is how Paul Romer, a Dutch television executive and the co-creator of the original “Big Brother” series, describes it in an endorsement on the Mars One Web site. These days, Mars One is raising more eyebrows than cash. Until this year, the project was financed almost entirely by Mr. Lansdorp himself. Last month, Mars One secured its first commitments from outside investors, and those funds will be used to finance the first conceptual design studies for the various hardware components, including the spacecraft and lander, life support systems, supply vehicles and communications systems. The site has received about 1.7 million unique visitors since it went live last June, according to Google Analytics. But more than 8,000 people, from more than 100 countries, have already e-mailed résumés since online recruiting began in January. Dr. Norbert Kraft, a specialist in aerospace medicine and a former researcher at NASA, as well as the space agencies of Japan and Russia, leads a team of experts who will vet applicants for their basic suitability. The pool will be narrowed to a few hundred candidates by 2014, at which point Mars One hopes to begin televising the process in select countries.Nick du Plooy, a medical student applying from Pretoria, South Africa, confessed that he was not a huge fan of standard-fare reality TV and hoped Mars One would be “held to a higher quality standard.” Mr. Plooy, 22, said he imagined the grueling routine of his coming medical internship and residency years would help him prepare for the rigors of life as an astronaut. Mr. Lansdorp has set up Mars One as a nonprofit foundation, but it is the controlling shareholder in a for-profit company, Interplanetary Media Group, that owns the exclusive right to sell mission broadcast and advertising rights. Just how much those rights might be worth is anyone’s guess — but Mars One is betting that it is a lot. Mr. Lansdorp cites a report published last year by the International Olympic Committee that said the winter and summer Games — three-week events, staged every two years — had generated about $5 billion in revenue from 2009 to 2012, of which more than $3.9 billion had come from the sale of broadcast rights. The more direct comparison, reality TV, has generated significant revenue for broadcasters for years. Although past its peak, the British version of “Big Brother” generated in 2006 as much as a fourth of the annual advertising revenue for the country’s publicly owned Channel 4 network. Viacom, the American media company, attributed much of the double-digit growth in its cable television ad sales in recent years to the success of “Jersey Shore,” which ended a six-year run on MTV television in December. Still, not everyone is convinced that Snooki in Space would fly. “The idea of flying to Mars one-way is not as outlandish as it may appear,” said Robert Zubrin, former chairman of the United States National Space Society and a longtime advocate of a privately financed human mission to Mars. And he argues that it could be done with a budget “in the single-digit billions” of dollars. It is for that reason, he said, that Mars One is focusing first on gaining credibility with prospective investors, sponsors and aerospace suppliers. Mr. Lansdorp declined to say how much he had budgeted for the initial publicity campaign, but experts like Mr. Zubrin estimate that it might take $30 million to $50 million. Peter Meijer, chief operating officer of the Dutch unit of Trifork, a software developer based in Copenhagen, said his company — which is also supplying Web-host and network technology for Mars One — agreed to invest an undisclosed sum with the goal of raising its own profile through association with the mission. Meanwhile, discussions are under way with prospective suppliers. Mars One says it held initial talks with about a half-dozen companies, including big industry players like SpaceX, for its heavy rocket launchers, and Thales of France, for its pressurized cargo vehicles. Next week, Mr. Lansdorp said, he will announce Mars One’s first supplier contract, with a U.S. aerospace company. Mr. Lansdorp is more pragmatic than wistful about why he does not plan himself to migrate to Mars. Few such constraints would hold Junwei Cheng earthbound. Mr. Cheng, who has applied for the Mars mission, is a 26-year-old metals importer from Taiyuan, a city of four million people in northeast China. He admits that he is not much of a people person but says he is used to living in cramped surroundings. “Sometimes when I take the subway or the bus, I can’t even find space to put my feet,” he said.